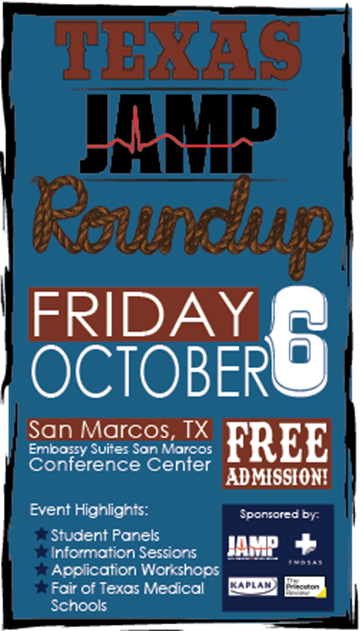 On, Friday, October 6, Texas State University is hosting the Texas JAMP Roundup. This free event, held in conjunction with the Texas Med-Dent Roundup is where high school seniors, college freshmen, counselors, advisors, and parents can learn more about the Joint Admission Medical Program and how to prepare for medical school. The Joint Admission Medical Program (JAMP) is a special program created by the Texas Legislature to support and encourage highly qualified, economically disadvantaged students pursuing a medical education. If you are interested in either becoming a physician or learning about becoming one this event is for you!